A travel journal is the most important thing I pack in my suitcase when I travel, from anything from a weekend away to long international trips. It has led me to be more serious and intentional about my vacations and journeys. When I reflect each day about how my trip is going, anything different that’s happened and what I’m surprised about, I’m always grateful for it when I’m home looking back at what I’ve written. It’s a great way to plan our your trip before-hand and there are so many different methods to use. Here are some key reasons why having a journal might work for you and a quick travel journal guide with tips. Remember more: without taking notes about what I’ve done on vacation, my trips easily slip by me. When people ask, “So what did you do?”, even a week after a trip, it’s hard to remember the small details about my days. With a travel journal, you can take notes of your activities, what you ate, people you met and things you learned on your trip, to remember for years to come. Reflect on what you learned: different cultures can teach us so much, which is why traveling is so important for everyone. But sometimes we can let what we learn go by, without recognizing it and acknowledging it. I try to write about my mistakes, what made me uncomfortable in another culture and what I found surprising. Reading your entries after your trip helps the reflection process as well. 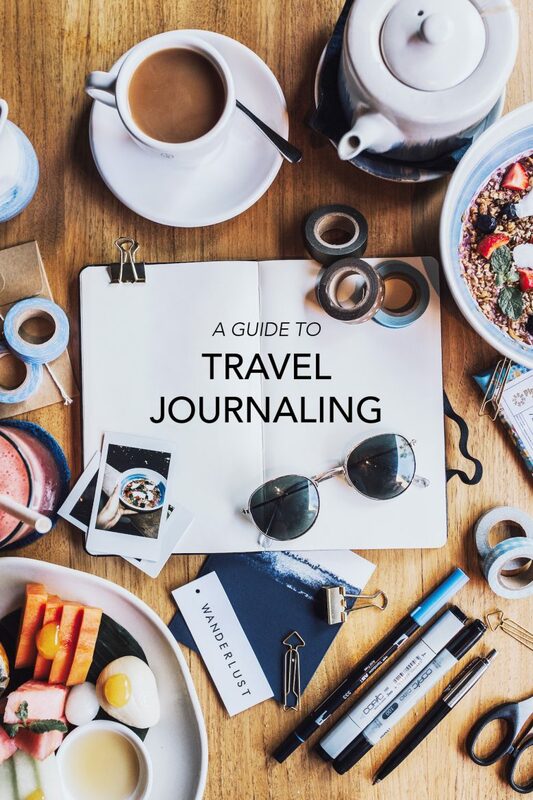 Stay inspired at home: Aside from being used while you’re actually traveling, keeping a travel journal can help you maintain that wanderlust mind frame even during your life at home. So many people wish they could travel more or look to travel as an escape from reality, but simply having this mentality of looking for new things everywhere you go (even if that’s in your hometown) can really be a positive influence. Keep a physical journal. Having a notebook to write in is a huge part of travel journaling. it’s very therapeutic to write things down and you can also include other types of media if you like. If you’re the type of person who hates handwriting or needs to cut down on luggage, you can try this online journaling app. If you have a bullet journal, add your travel journal into your bullet journal and index it! That way you don’t have multiple different journals from trips and you can keep everything together. Start your travel journal at home. There are plenty of online prompts for travel writing. You can journal about topics like the reasons you’re going, what your expectations are, and what you have planned. This is also a great place to record your pre-trip research and keep it all together (things to do, restaurant recommendations and sights to see are all things you want to research before you leave). Include your itinerary in your travel journal, to keep all of your flights, accommodations and other activities that you’ve planned in advance together. This allows you to see each day laid out and map out your plan from there. When you journal at home, include your packing list as well. Notes about the weather and your activities will help you decide what to bring in your suitcase. Keep a food section in your journal and write down your favorite (or least favorite) dishes and where you found them. This is super helpful for giving recommendations later or just jogging your memory about a specific trip. Write daily while you’re traveling. This tip is super important because you’ll never remember things like you do on the first day. By taking some time each day to record what happened, you have alone time to be intentional about traveling and won't let each day fly by with the rest. Keep photos from your trip, postcards, doodles, ticket stubs and anything else that will remind you of special moments. While my journal is very simple, you can get as creative as you want with this and even make it into a sort of scrapbook. Include your daily highlights and ask for those of your travel companions as well. My boyfriend doesn’t love me asking him for this all the time, but it’s so fun to compare what I loved and what he did in one spot. Reflect on your trip and write about how it affected or even changed you, when you’re back home. This journal is very personal, and the more inside your head you get, the more valuable it can be to you later. I have journals from a couple years ago that I love looking back on, because I shared my emotional standpoint alongside daily activities. That’s it! For my tips on journaling in general (because I am a true believer) check out my post on how to bullet journal. I also loved the following posts about reasons why to keep a travel journal and this super handy post with ideas for what to include and free printables . p.s. This is my 100th post on this blog! Thanks to anyone who's read along my journey so far and who's encouraged me to keep going. It's become something super important to me and a great way for me to share my life over here with friends, family and even strangers online. I'll have a post up on Friday about some of my favorite all-time posts and great moments since starting my blog in August 2016.